The NHEF is now accepting applications for its 2019 Scholars Program. We welcome applications from motivated students with a true passion for leadership and personal development. We aim to substantially increase the number of well-educated Nigerians assuming positions of leadership in Nigeria and on the global stage. To achieve this goal, we seek to address the skill gaps in key sectors of the economy by providing talented Nigerian University students with a broad range of programs ranging from critical on-the-job training to hands-on-learning skills, required in the employment process and overall career development. With the help of our partner firms, we are providing world-class training and support to our Scholars to enable them compete effectively in the job market. NHEF Scholars represent a select cohort of students from each of our Partner Universities. They have demonstrated strong academic excellence and well-roundedness in both professional and extracurricular pursuits. We expect our Scholars to be fully devoted to Community Service, Philanthropy as well as making a lasting impact in society. Through this program, they will become successful future employees with an understanding of the roles and responsibilities attached to their industry of choice. As of 2018, we achieved the milestone of a cohort of nearly 100 Scholars and hope to continue to develop even more promising Nigerian students. 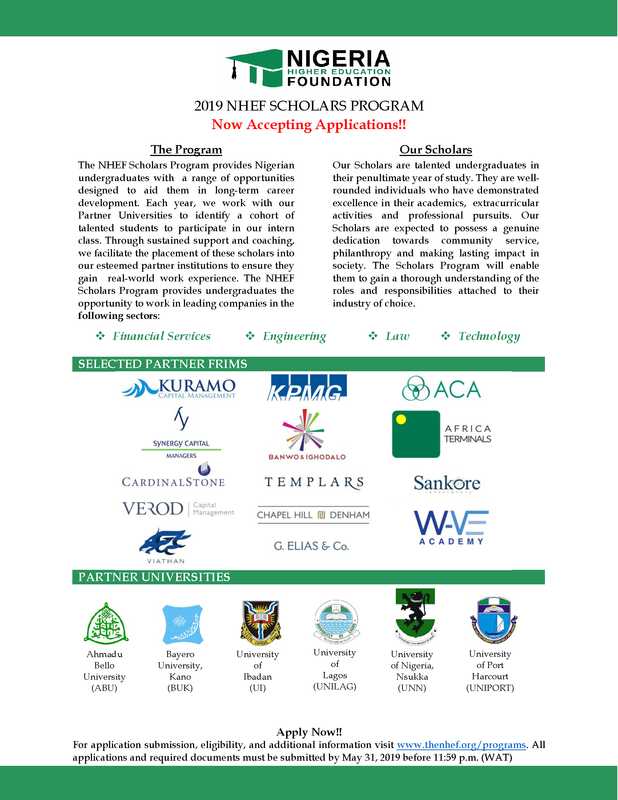 The NHEF is in partnership with prestigious companies and organizations across a broad range of industries in Nigeria. Our key industries are Financial Services, Consulting, Law, Technology and Engineering. We aim to broaden the scope of our industry tracks over time. We believe our partnership with these firm will offer invaluable exposure to our Scholars. The NHEF is now accepting applications for its 2019 Scholars class.